Logan Airport in Boston is New England's busiest air travel hub. If you're flying in or out of Boston and need to stay near the airport, here is your guide to hotels near Boston Logan Airport. Many of these hotels offer free parking and free airport shuttle service. Keep in mind: Even if you're not traveling by air, hotels near the airport can be a cheap alternative to pricier lodgings in downtown Boston. Several public transportation options link the airport with other city locations. If you need a hotel convenient to Logan Airport, the Hilton Boston Logan Airport offers complimentary shuttle transportation between the hotel and the airport around the clock. There is also a sky bridge connecting the hotel with terminals at Logan, making this a good choice for travelers who arrive in Boston late or need to catch an early flight. Other hotel features include a fitness center with an indoor pool, on-site dining, room service and a free shuttle to the subway and water taxis. Park, Stay and Fly packages are available, whether you're jetting off for two nights or two weeks. This Marriott family hotel in Chelsea, Massachusetts, is just 1.1 miles from Logan Airport and offers some of the cheapest rates. With free shuttle service to the airport and the airport's MBTA subway station, it's a convenient option. Plus, you'll find amenities to rival pricier properties, including an indoor saltwater pool, lobby bar and lounge, free high-speed Internet and free hot breakfast buffet. The hotel is pet-friendly, too. Located just about three miles from Logan Airport in Revere, Massachusetts, this family-favorite hotel features complimentary parking and free airport shuttle service, plus a heated indoor pool, fitness room and free hot breakfast buffet. A Mexican restaurant is located on-site. Ask about Park & Fly packages that include parking for up to 21 nights. 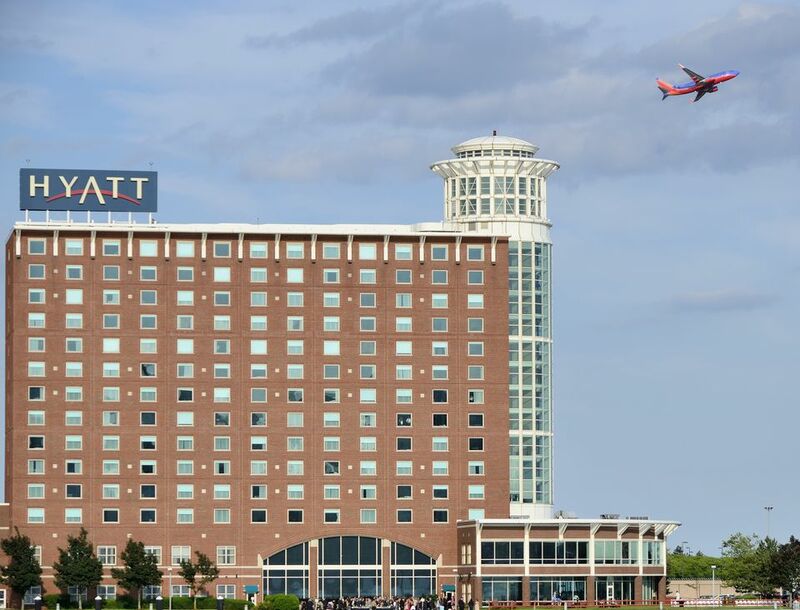 The luxurious, 270-room Hyatt hotel near Logan Airport has a complimentary 24-hour shuttle to airport terminals and public transportation, plus many amenities for business travelers and vacationers, including a StayFit gym with views of Boston Harbor and the Boston skyline. The hotel also has an on-site restaurant and room service. It is a Green Business award winner for its environmental initiatives. Traveling with your dog? No problem: Dogs under 50 pounds are accommodated with advance reservations. Looking for a cheap hotel near Logan Airport? The Holiday Inn Express, located 11 miles from the airport in Saugus, Massachusetts, may be your best bet. Not only does this hotel offer a free 24-hour airport shuttle, seasonal outdoor pool, complimentary hot breakfast buffet, and free WiFi Internet access, it has rooms available at a rate that's hard to touch in the Greater Boston area. Park and Save deals include seven to 14 days of free parking with your one-night stay. Located just one mile from Logan Airport and three miles from downtown Boston, this Marriott Courtyard offers free 24-hour shuttle service to and from the airport and low overnight rates. Other hotel features include a fitness center, indoor pool, restaurant, and lounge. This upscale, all-suite hotel, which caters to business and leisure travelers, offers free, 24-hour shuttle transportation to Logan Airport and to the MBTA Blue Line subway station, which is a four-minute walk away. Complimentary made-to-order breakfasts and evening receptions are included with room rates. Embassy Suites also offers guests a fitness center, indoor pool and whirlpool, and dine-in or room service options at Porter Grill & Bar on-site. This 30-suite, freshly renovated hotel is located within two miles of Logan Airport in Winthrop, Massachusetts, but its decor and location feel a world away. It is a good choice for week-long or longer stays in the Boston area, even if you don't have a flight to catch. Rooms feature well-equipped kitchenettes and 55" TVs. An extended continental breakfast is free each day, and coffee, tea, and snacks are always available. Public transportation is easy to reach, and the beach is less than a block away. The hotel's taxi partner will transport you to Logan for a flat fee of $20. Be aware there is a fee for on-site parking.